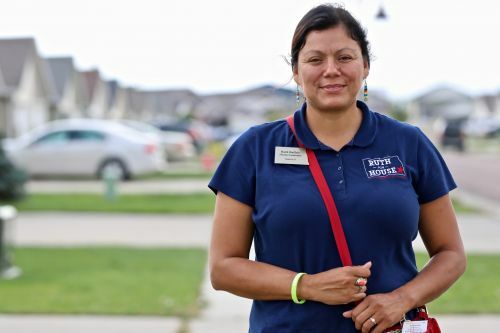 FARGO – Persistent and seemingly coordinated attacks from area media outlets against Representative Ruth Buffalo have pushed her to become one of the more successful legislators of 2019. Four bills and one resolution were signed into law, she said. Her bills range from allowing students to wear cultural regalia at graduation ceremonies, to hotels, schools, and law enforcement training on missing and murdered Indigenous prevention and awareness. She has also introduced legislation for a state repository for all missing persons, and successfully sponsored a resolution to support Savanna’s Act, a bill introduced by former Senator Heidi Heitkamp related to law enforcement reaction and data collection of the nation’s missing and murdered Indigenous people. 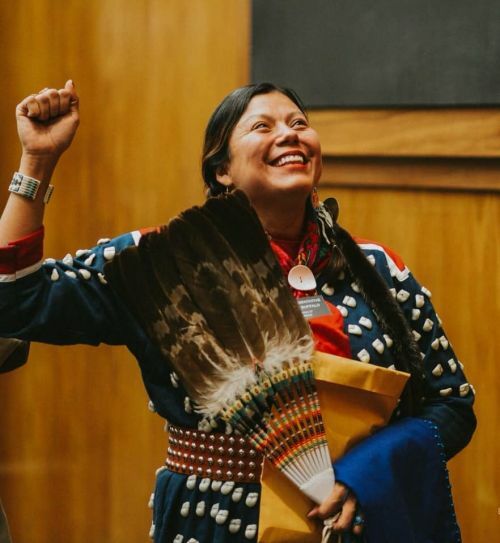 As a newly elected legislator, the first Democratic-NPL Indigenous women to be elected in the state’s history, Buffalo is a registered member of the Mandan, Hidatsa, Arikara Nation. She is originally from Fort Berthold and represents District 27 in South Fargo. Media personalities Chris Berg, of Valley News Live “POVnow,” radio talk show host Scott Hennen of AM 1100 “The Flag,” and Rob Port, conservative opinion writer with the Fargo Forum have attacked her repeatedly. Tore Maras-Lindeman, of Red State Talk Radio, which features Qanon symbols in advertisements, made a threatening comment on social media in early March against Buffalo and her family prompting an investigation by the North Dakota Highway Patrol. So far, Buffalo has refused to respond to their questions because she said she knows her words will be twisted to fit their agendas, she said. Recently, Port attacked Buffalo again for speaking at a Represent Us Education gala in Nashville, Tennessee, which featured an award presented by Hollywood actress Jennifer Lawrence. Her airfare and lodgings were paid for, and now, even though the North Dakota Legislative Council sees no violation, she is thinking about paying the money back, she said. Lodging expenses totaled $578.94, and $848 for her economy seat on United Airlines. Represent.Us Education Fund is a national, nonpartisan 501(c)(3) organization that seeks to challenge special interest financial investment in American politics and government. Buffalo spoke on finding ways to improve the political system and the government, she said. John Bjornson, director of the North Dakota Legislative Council, said he had not investigated exactly how much money Buffalo received in reimbursements, but that she was not in violation under current law. Two bills are in play for defining what the future Ethics Commission will be. One bill is attempting to keep to the original intent of Measure 1; the other seeks to limit political donation reporting, among other issues. Representative Joshua Boschee, a Democrat, said the media attacks against Buffalo are attempts to further polarize and divide. “People are sick of this polarization, and she has worked through that and got bipartisan bills passed,” Boschee said. “She’s had a lot of success in the bills she has introduced, there has been a lot of interest in the bills especially related to murdered and missing Indigenous people. During the budget hearing for the Peace Garden near the Canadian border, Buffalo said she asked an important question. “I asked the question, ‘what are we doing across the state to facilitate peace?’” Buffalo said. She’s dealt with similar attacks all her life, she said. She refuses to speak on POVnow’s show, or at AM 1100, or with Rob Port because she said they’re not journalists seeking the truth, they’re personalities pushing agendas. An instance she described was when Hennen messaged her, days after attacking her, asking her to support Senate Bill 2344, pertaining to tribal oil tax agreement. Instead of reporting to her the facts, he explained his personal positions on the bill and asked for her support. Buffalo voted against one aspect of the bill, the pore space practices, but voted yes on the tribal state tax agreement. During the North Dakota 66th Legislative Sessions Buffalo has also supported bills to include tribal registries in jury selection processes, ban the box legislation limiting public employers inquiries into criminal histories of employees, and relaxing breastfeeding in public laws. She has fought for the rights of the mentally and developmentally disabled, for sexual assault restraining orders, for lowering the prices of diabetes medication, and for protecting victims of child abuse. “I think the more challenging thing has been outside distractions, people trying to distract me from the real work that’s happening,” Buffalo said. “Truthfully, I’ve gotten more attacks than anybody I can think of and I’m not trying to keep tabs. “Next round will be Chris Berg “Point of View” regarding Rob Port’s story,” Buffalo said.